Attukal Pongala is a women’s only festival celebrated in the ancient Bhagavathy temple at Attukal in Thiruvananthapuram district. The ten-day-long temple festival is in the Malayalam month of Makaram-Kumbham (February-March). Ninth day is the most important day of the festival when the famous Attukal Pongala Mahotsavam takes place. The culmination of Pongala is with the sacrificial offering at night known as Kuruthitharpanam. Countless women from all castes and creed from Kerala and the neighboring state of Tamil Nadu throng the temple premises to make ‘Pongala’ offerings to the Goddess, believed to be incarnation of ‘Kannaki’, the heroine of ‘Silappathikaram’ written in 2nd century A.D.
Festivities start with rendering songs about the deity. On the ninth day thousands of women gather in the temple to prepare Pongala, which is porridge of rice, sweet brown molasses, coconut gratings, nuts and raisins. The ritual of cooking starts very early in the morning and by noon, Pongala would be ready. 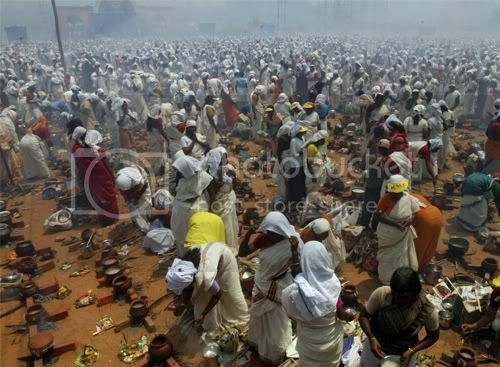 Then the chief priest blesses the devotees by sprinkling holy water and showering flowers and then the pongala is taken back to the houses by the women. The Thiruvananthapuram city Corporation has employed over 2000 sanitation workers to ensure sanitation in the temple premises. 20 health inspectors and 36 junior health inspectors would oversee the activities. After the Pongala ritual the bricks used to make kilns to cook the Pongala will be removed by Kudumbasree workers. 35 garbage trucks are being pressed into service to clear the waste. Drinking water supply will be ensured by the Corporation and health squads are formed to carry out inspection in hotels and restaurants. Pongala draws large number of devotees and tourists to this city. Colorful processions comprising Thalapoli, Kuthiyottom, caparisoned elephants etc and musical programmes by famous artistes add charm to the festivities. Enroute, the procession will be greeted by Nirapara offered by the devotees and the procession returns to the temple the next morning marking the grand finale of the festival.